After months of speculation, and I mean major speculation, Apple sent out invitations today for its October 4 “Let’s talk iPhone” event, so Kudos to my partner, who hit the nail on the head with the October prediction. The iPhone5 is probably the most anticipated cell phone ever to launch, given Apple’s resounding success in the mobile space and the rapid adoption of smart phones. 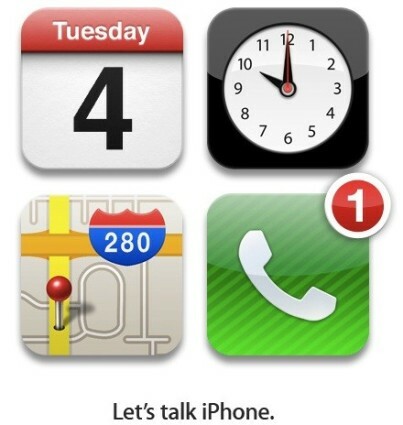 So the only quesions left to be answered at this time are, what should we expect with the iPhone5 and when can we expect to see the iPhone5 inCanada. Taking a leaf from my partners page again, I think he will be right on the money regarding the internal specs of the iPhone5 and the major question outstanding, is whether or not we will see a new design for the iPhone5. Of course if that happens that will just make the Apple fanbase go even more crazy than they are already and with the number of emails and questions to our team at myCELLmyTERMS, things are just heating up. So let’s break down the iPhone5 specs logically. Improved CPU Speed – Absolutely Yes. RIM take notes here please. Better Camera – You bet. 8MP will become the standard and out goes the 5MP camera in the iPhone4. We really are spoiled. NFC Technology – Yes – The market is just getting a teaser of what the mobile wallet will mean, however, with so much happening in the m-commerce space the fight for your wallet is just getting underway. Sleeker Design – Really don’t know what to say here, but the rumours indicate a change in design, which would be a great announcement for Tim Cook – New Apple CEO – to deliver. Larger Screen – If we get the redesign we might see a slightly larger screen. Take a quick overview of this blog for more details on what to expect with the new iPhone5. As you know, we Canadians are always slightly behind the curve when it comes to the latest tech goodies being released and I believe the new iPhone5 won’t arrive inCanadauntil some time in early November; still enough time for those Christmas stockings. So whatever you do, get the cell phone companies to compete for your business and find the best iPhone 5 deal in Canada. Kye Husbands is co-founder of myCELLmyTERMS, a Toronto-based company that helps cell phone users negotiate wireless plans with independent dealers.